Web3D member, Bitmanagement Software launches BS Content Studio (beta) at Siggraph 2013 in Anaheim, USA. The 3D world actually is facing obvious changes. A new format for web based scenes and application is on the horizon. HTML4 will be replaced by HTML5, which will offer many more features and moreover has no need for using plug-in’s. Right now the Web3C consortium is discussing the way how to integrate X3D, the 3D format of the Consortium, into the coming new HTML 5 world. Thereto the X3D working group has made multiple contributions to W3C's HTML5 Working Group for the purpose of integrating X3D with HTML. The goal is to make it possible to visualize 3D scenes and application, which means 3D Graphics, using the future HTML5 format. Therefore the Web3D participation at this years Siggraph is mainly focused on this issue. The German 3D software developer, Bitmanagement Software GmbH at the Starnberg Lake which is partner of Web3D Consortium in Mountain View, California, where the company also is member of the Board of directors, has contributed an authoring tool, which enables to create interactive and multimedia internet ready content. This tool will sustainably accelerate and make it less difficult to generate 3D models and interactive content of successful operating scenes and application. Even "Non 3D Realtime - Specialists" are in the position to generate 3D Realtime applications for the use in the internet. 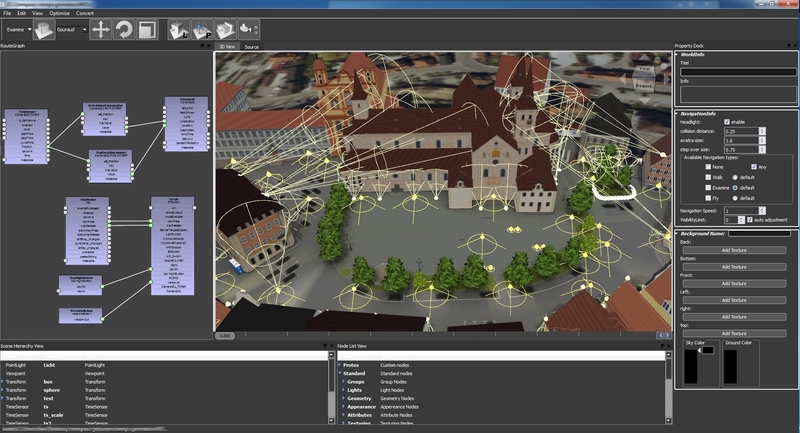 The Bitmanagement authoring tool based on the 3D Engine BS Contact is focused on augmenting 3D geometries which have been developed with the leading CAD-, GIS-, and Design Software programs, and medial content with the possibility to interact, amendments like light and shadow effects, multi user feature and animation of motion sequences of objects and human beings. The optimized output referring to rendering speed, to download, respectively 3D streaming-readiness and the integration in Webpages will be provided in X3D format only by one push on a button. Doing so one is able to use 3D content on the cross platform (Windows/Linux/Mac/iOS/Android), and crossbrowser (IE/Firefox/Chrome/Opera/Safari) and under HTML5 formats in X3DOM. The new tool will also support export to X3DOM format close to HTML5. X3DOM is developed by Fraunhofer IGD and runs in HTML5 browsers with WebGL support. The WebGL standard is developed by US industry-consortium Khronos for hardware-accelerated 3D graphics on the Internet. The most considerable advantage offered by WebGL is that there is no need for using plug-in’s for users. In former times the scope for design with HTML is limited to text-formats "bold" and "italic", later on to pictures, charts and forms. However the presentation of 3D animated objects and video-content browsers depended on plug-in’s. Using WebGL will bring a remarkable change- at least for 3D teaser applications. Peter Schickel, Bitmanagement CEO: "We continue to believe, that for ambitious and integrated 3D real time applications, as demanded from the CAD/GIS industry, plug-in’s are essential. The more so as also the Microsoft Internet Explorer does not support WebGL for security reasons. However with the support of the X3Dom export in BS Content Studio Bitmanagement has made a leap forward towards 3D anywhere." The new authoring tool BS Content Studio actually has reached the Beta-phase, where user tests are executed. Interested parties are asked to apply for a tester account at info@bitmanagement.de. The development of the 'BS Content Studio' - software is part of a ZIM-Project and co-funded by Federal ministry of economy and Technology, which has been approved by "The deutsche Bundestag".